A movement is gaining momentum in western Odisha for Inclusion of Kosli (also referred to as Sambalpuri) language in the 8th Schedule of the Indian Constitution. Kosal Discussion and Development Forum (KDDF), formed to preserve the linguistic and cultural identity of the Koshali speaking people apart from acting as a catalyst for development of the region, has submitted a memorandum to Prime Minister Manmohan Singh on Tuesday. Copies of the memorandum were also submitted to the President of India, UPA chairperson Sonia Gandhi, Leader of Opposition Sushma Swaraj, Orissa Governor, Chief Minister and the MPs from the State among others. The memorandum stated that recognising the complexity of linguistic diversity in India, the Union government passed the 93rd Constitutional Amendment that enabled the government to have a fresh look at the possibility of inclusion of other Indian languages in the 8th Schedule. 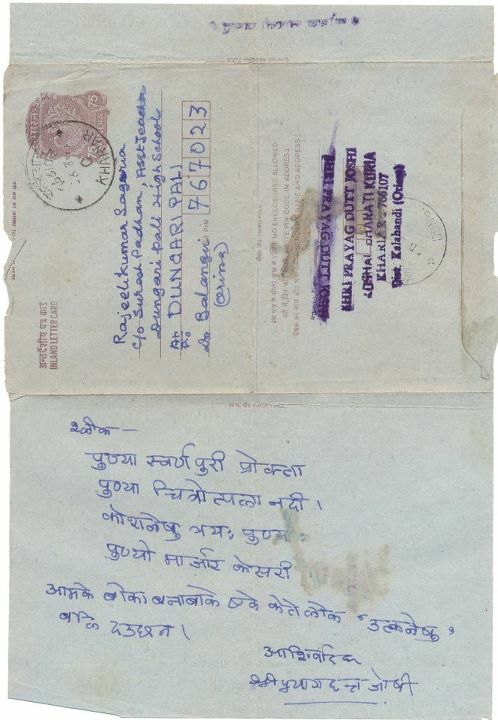 Consequently, four languages — Bodo, Dogri, Santhali, and Maithili — were included in the 8th Schedule. “We the people of Western Odisha hope that Kosli will be included as our situation is identical to that of Maithili,” it noted. Kosli language is the mother tongue of 10 districts of western Odisha — Balangir, Bargarh, Boudh, Deogarh, Jharsuguda, Kalahandi, Nuapada, Sambalpur, Sonepur, Sundargarh and Athmallik sub-division. Besides, a large population of Raipur, Mahasamund, and Raigarh districts of neighbouring Chhattisgarh state also uses Kosli language as their mother tongue, pointed out the memorandum. The Kosli language and literature is rich and vast. It has publications in a wide variety of subjects such as architecture, astrology, medicine, music, arts, philosophy, and literature. Its songs, dances, and drama have been popular across the world while its cinema has also gained international attention. While there are newspapers and a large number of periodicals being published in Kosli, the national broadcaster All India Radio and various television channels are also airing programmes in the language, according to the memorandum. Bhubaneswar, Sept. 21: The Orissa State Pollution Control Board has asked 26 of the total 109 sponge units in the state to cut down production to reduce pollution levels in the sponge iron plants. Sources said the units had been asked to scale down production for failing to stick to the bag filter size prescribed by the pollution control board on the recommendations of IIT, Kharagpur. Bag filters are meant to filter the ash generated by burning of coal in these units to keep the environment clean. The Orissa government is keen on reducing the pollution levels in sponge iron plants, which are considered among the most polluting industries in the world. The units are located in Sundergarh, Keonjhar, Sambalpur, Jajpur, Jharsuguda, Cuttack and Mayubrhanj districts. This is not the first time the pollution control board has cracked its whip on the erring sponge units. In June, it had served showcause notices to 68 of these units. Six had also been shut down. Member-secretary of the board Siddhant Das said the IIT, Kharagpur was commissioned to make a study on the pollution control requirements in the sponge iron plants in 2009 when the number of units in the state was 104. The organisation had recommended filter bag capacity for each unit, but some of them complied. Since ash generation in these units had gone up owing to use of the poor quality coal, air quality in and around these plants was bound to be affected significantly unless the plants used filters of the required size as prescribed by the expert body. Bulk of coal produced in Orissa was of F and G grade, which has high ash content. Sources said the ash generation was almost to the tune of 50 per cent, when this coal was used in the plants. In June, showcause notices were issued to 68 sponge iron units for failing to meet the pollution control norms. “Forty two of these have since complied with the norms and enhanced the capacity of their bag filters,” said Das, adding that the board was keen to ensure that the remaining 26 also fell in line. Orissa is one of the largest producers of sponge iron in the country with plants operating in six big clusters. As a consequence, it also bears the brunt of environmental pollution caused by this industry. In the past few years the central govt. has included different Indian languages in the 8th schedule of the Indian constitution by the recommendation of various committees. It shows prudence on the part of Indian government in being flexible in recognizing the complexity of linguistic diversity in India. In 2003, the 93rd Constitutional Amendment was passed which enabled the government to have a fresh look at the possibility of inclusion of other Indian languages in the 8th schedule. Consequently, four languages, viz. Bodo, Dogri, Santhali and Maithili were judged to be included in the 8th schedule. We the people of Western Odisha were hoping that Kosli be included as well because our situation is identical to that of Maithili as it is explained in the following sections of this memo. Therefore, we humbly request you to examine our request by the same yardstick used to include the four recent languages in the 8th schedule of the Indian Constitution. 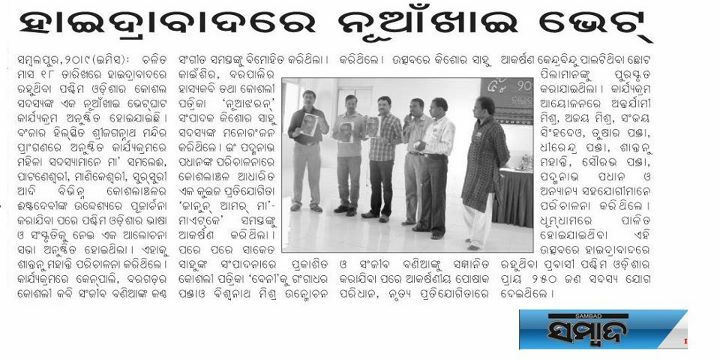 The Kosli language and literature is vast as it is blessed with a group of dedicated writers. A large number of books are published regularly and available in the Kosli language. Epics like “Ramayana”, “Mahabharat” and “Meghduta” are translated into Kosli language.2 Kosli language has a rich literature in different areas viz. Architecture, Astrology, Mantra-Tantra-Yantra science, Medicine, Yoga, Music, Arts, Dance, Drama, Yoga, Philosophy, and Grammar. Kosli dramas, songs, and dances are popular across the world. Kosli dramas are highly acclaimed and regularly staged at various places of India. For instance, a recent Kosli language play “Maau” is aiming to enter the Limca record book by becoming the biggest ever stage show of its kind in the world.2 In addition, the Kosli language cinema is attracting world wide attention. “Bukha (Hunger)” a Kosli language movie has won the Indian national award, an international jury award at the Gijón International Film Festival, Spain and was selected for World Rural Film Festival, Aurrilac, France.2 The All India Radio (viz. Sambalpur, Balangir, and Bhawanipatna) and television channels (viz. Nxatra news and OTV) are broadcasting their news and entertainment programs in Kosli language. More than five registered newspapers and seventy magazines are available in Kosli language.2 Unfortunately Kosli language has no political and official support although there was a discussion in the Indian parliament to include Kosli language in the 8th Schedule of the Indian constitution.3 Recently the Orissa govt. has recommended the Ho language for its inclusion in the 8th schedule of the Indian constitution.4 This is a welcome step. Along this line, we sincerely hope that the Orissa govt. will recommend Kosli language for the inclusion in the 8th Schedule of the Indian constitution. Western Orissa area contains 40 to 50 % of the state’s population. The key to development of western Odisha is the Kosli language. Drop out rate in schools particularly in rural and Adivashi area can be ascribed to, among other variables, teaching in Odia language which is not used in day to day communication. It is as if learning through an alien language. Kosli is the dominant means of communication through out western Odisha. 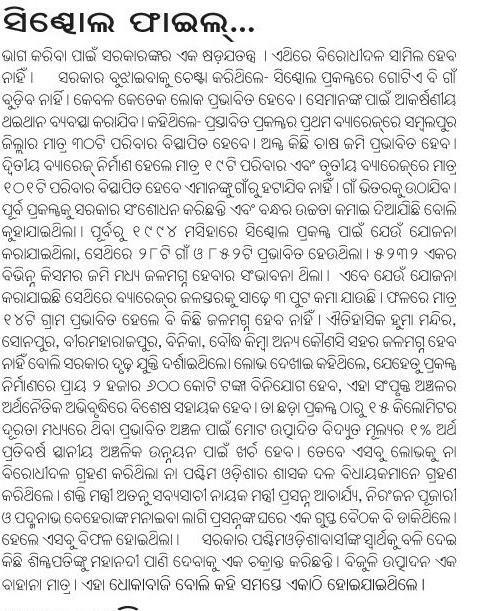 Though we have several tribal languages, all tribals have functional capability in Kosli not Odia. That is the main reason why KBK has been found literacy rate is so low. We also have large population of scheduled caste in the area who are similarly impacted. It has caused various problems viz. i) the overall marks of students from western Orissa are lower than the students of coastal Orissa and ii) many bright students of western Orissa fail again and again in both 10th and 10+2 examinations because of their poor knowledge in Odia language. Recognition of Kosli language will facilitate education among the kids of western Orissa in their mother tongue and solve the above mentioned problems. In spite of aggressive Odianisation, population of western Orissa has retained Kosli language for day to day communication. In large population centers where people of other states, especially from Bihar, Jharkhand, Chhattisgarh, Bengal, Punjab, Gujarat and other North Indian area have come to work, they have opted Kosli instead of Odia because the accent of Kosli follows North Indian pattern. And when poor Koslis go out of their area to seek employment they choose to go to other Hindi speaking area such as Chhattisgarh, U.P, Bihar and Jharkhand instead of Odia speaking area in Odisha. All Kosli can be easily identified by their accent when they try to speak Odia. Elected representatives from western Orissa can not engage in debates in the State Assembly because of their poor knowledge in Odia language. Recognition of this language will facilitate communication in the legislative and social sphere. Dictionaries, grammar books, plays, novels, anthology of poems, granthavalis of major poets, Kosli panjikas, several books on history of Kosal (western Orissa), and biographies on Kosli heroes are already available without any financial help from the government. Recognition of Kosli language will avail grants directly from the central government. This will facilitate the research and future development of Kosli language. Currently, notices are given in the villages of western Odisha in Odia; not very literates do not understand the full implications of these notices. 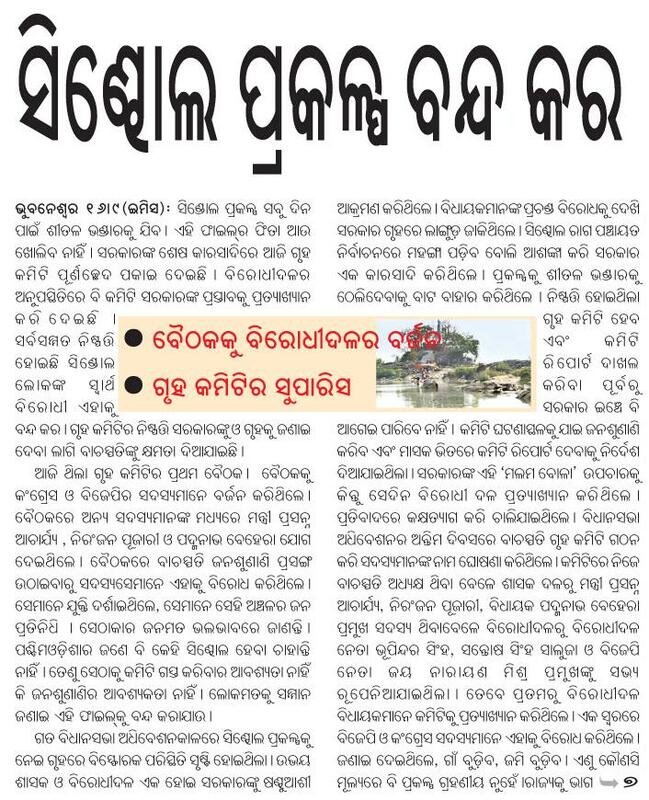 Civil servants from other areas who do not even have rudimentary knowledge of Kosli language can not communicate with citizens, thus resulting in miscommunication. In fact, Orissa is among the minority of states which claims to have only one language. Out of 28 states, 15 have more than one official language. Out of 7 union territories, 6 have more than one recognized language. In a democracy, freedom of expression is a fundamental right of the citizen. Good governance requires efficient communication between the citizens and the government. In this context, inclusion of the Kosli language in the 8th Schedule of the Indian constitution will facilitate governance in western Orissa. Kosli language is intimately connected to the distinct culture and heritage of western Odisha, quite distinct from Odia culture. The unique folk songs and dances blends neatly with rhythm and punctuation of Kosli language. Inclusion of Kosli language in the 8th schedule of the Indian Constitution will promote the culture and heritage of western Orissa. Keeping the above mentioned points into consideration we request you to recommend the inclusion of Kosli language in the 8th schedule of the Indian Constitution. Acknowledgment: We thank the members of KDDF and other e-forums for suggestions. We are grateful to the people of western Odisha for constant support and encouragement. 5. 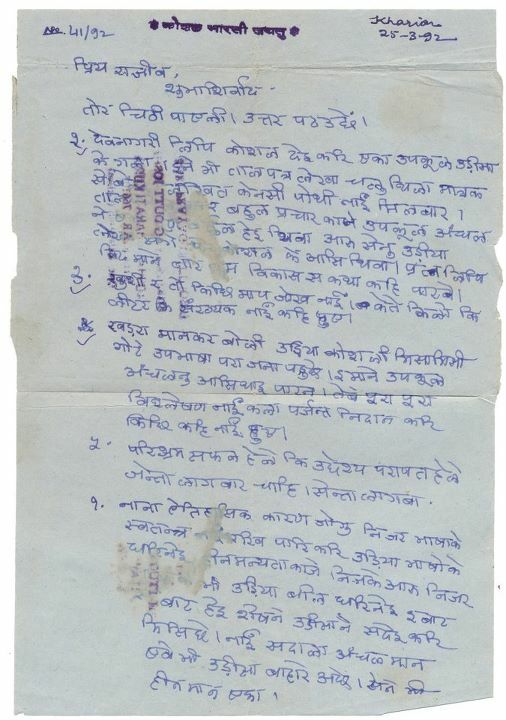 Kosli Bhasa Ra Sankhipta Parichay, Kosal Ratna Prayagdutta Joshi, pp 6, 7, 16, 17, Ed. Dr. Dolagobinda Bishi, 1991. 6. Peculiarities of Sambalpuri Language in Its Morphology; Dr. Ashok Kumar Dash, Surta, pp 35-38, Ed. Saket Sreebhushan Sahu, 2009. Click here to download the Kosli language memorandum. A house committee of the state legislative assembly constituted to take stock of the ground realities of the controversial 320 MW Sindol hydro power project has recommended scrapping of the project. “We have placed our views relating to the Sindol project before the house committee. Our views reflect the views of the people affected by the project. The house committee has recommended scrapping of the project,” said BJD MLA and one of the committee members, Padmanav Behera. The speaker of the legislative assembly and the committee chairman Pradeep Amat, however, declined to comment on the matter. “The committee’s decision will be known after we place our report in the assembly,” Amat told reporters after the committee’s meeting. The house committee on the controversial Sindol project was constituted after the assembly witnessed a stormy adjournment session in the monsoon session that ended on August 27. The Opposition Chief Whip Prasad Harichandan had demanded scrapping of the MoU signed with National Hydro Power Corporation (NHPC) on the project. The state energy minister Atanu Sabsysachi Nayak had maintained earlier that there was no question of going ahead with the project without the consent of the project affected people. The Sindol project was to affect 43,461 people belonging to 798 families in 60 villages. NHPC Ltd (formerly National Hydroelectric Power Corporation) and the Orissa government owned Orissa Hydro Power Corporation (OHPC) had recently signed an MoU to jointly implement three hydel power projects in the state at an estimated cost of Rs 2,600 crore. The three hydel power projects- Sindol-I (100 MW), Sindol-II (100 MW) and Sindol-III (120 MW) having a total capacity of 320 MW are expected to be commissioned in 4-5 years. All the three hydel power projects will come up onMahanadiriver.